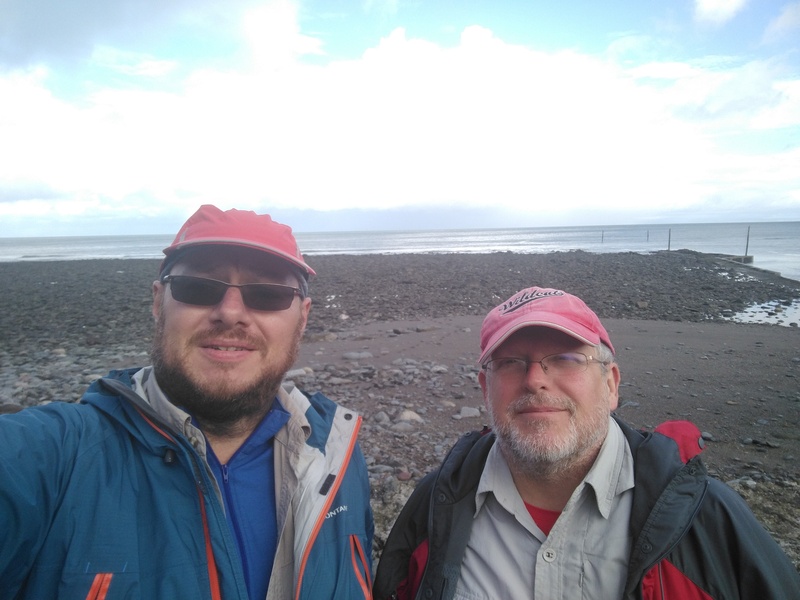 The rain started just as we got to Lynmouth, banishing the hopes that had arisen that the forecast didn’t seem to be playing out. We stepped onto the beach to take the obligatory start photo and then turned our faces southward and into the rain. 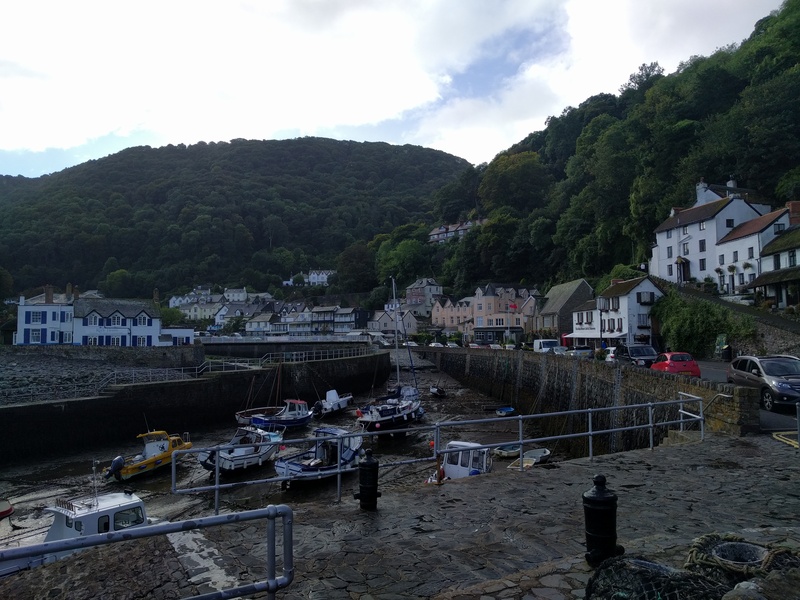 Before we got going in earnest I popped into a shop that had what seemed like the only cash machine in Lynmouth, needing to top up after the unexpected expense of a taxi from Barnstaple. With no more cash machines forecast for several days, lack of cash was a serious risk to the pub crawl. I asked the machine for £100, it gave me £80 and then promptly shut up shop. Yes I’d cleared the whole village out of cash, and I left hastily before the woman waiting to use the machine realised this. 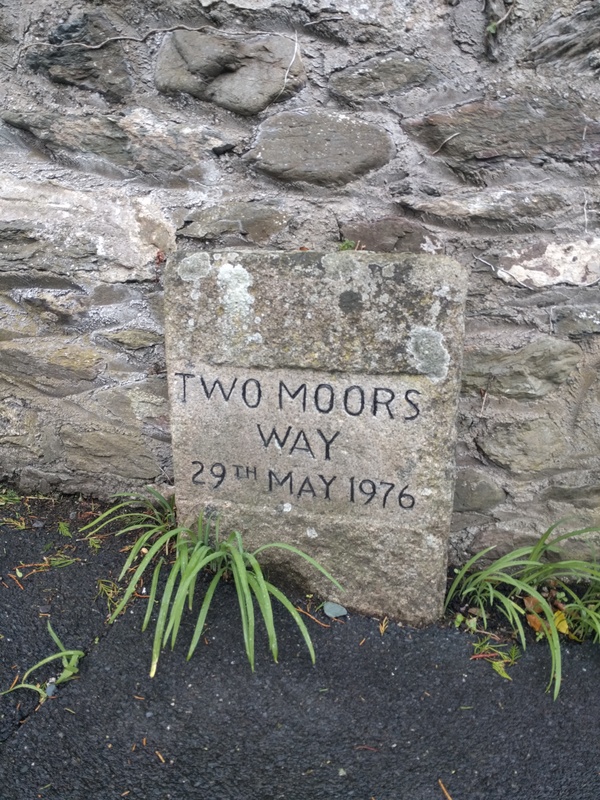 An initial wrong turn caused by a dodgy remembering of the description of the start of the route from the Two Moors Way booklet, still sat at home at Paul’s, saw us heading up Lyn Cleave towards Watersmeet. 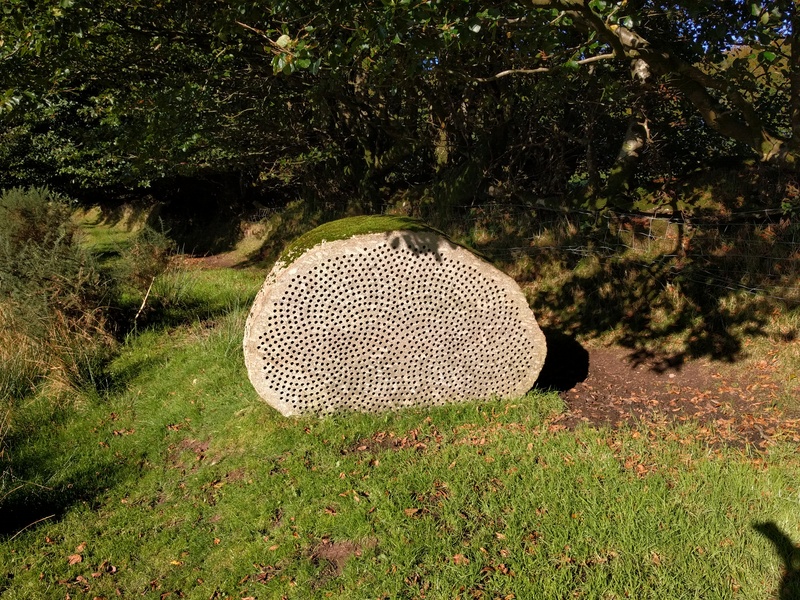 We’d only gone a quarter of a mile or so before we realised it was wrong and retraced our steps, finding a marker stone that showed the right way. “Let’s get all our mistakes over with on the first day”, uttered Paul – a phrase that was to linger over us for the next few days and torment us repeatedly. 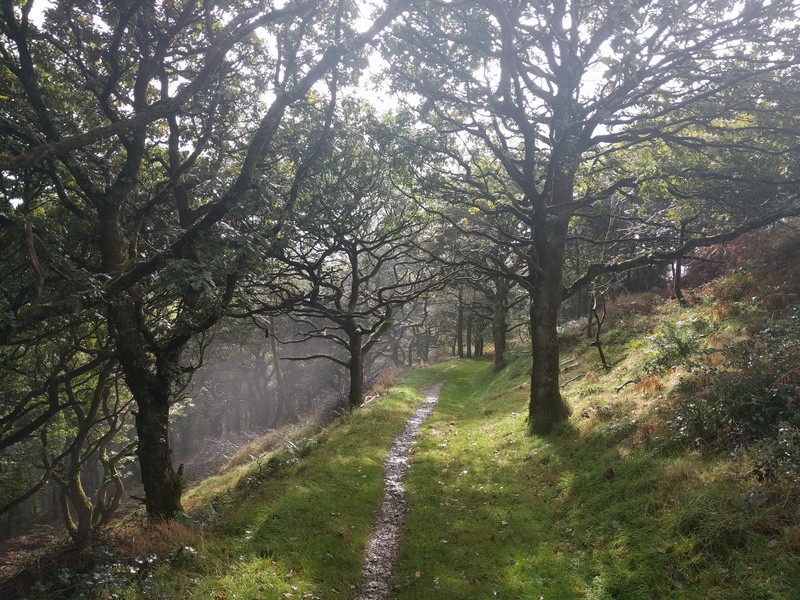 I didn’t think much of Paul’s “proper” route as it involved much steep climbing up a cliff directly onto the moor, but things improved when we emerged from the trees and got some views ahead, the deep groove of Lyn Cleave below us. We made our way along the hillside before dipping down to Combe Park for tea and cake, on benches in the rain. 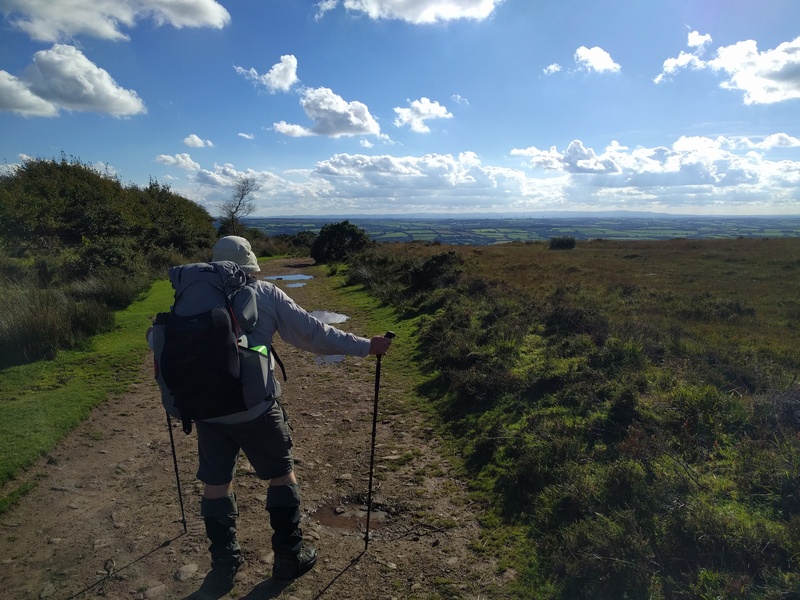 A bit more climbing brought us up onto Cheriton Ridge and what felt a bit more like proper moorland, stretching out in front of us. Wind and rain still lashed at us from the side, but interspersed with brighter (well lighter grey) moments. 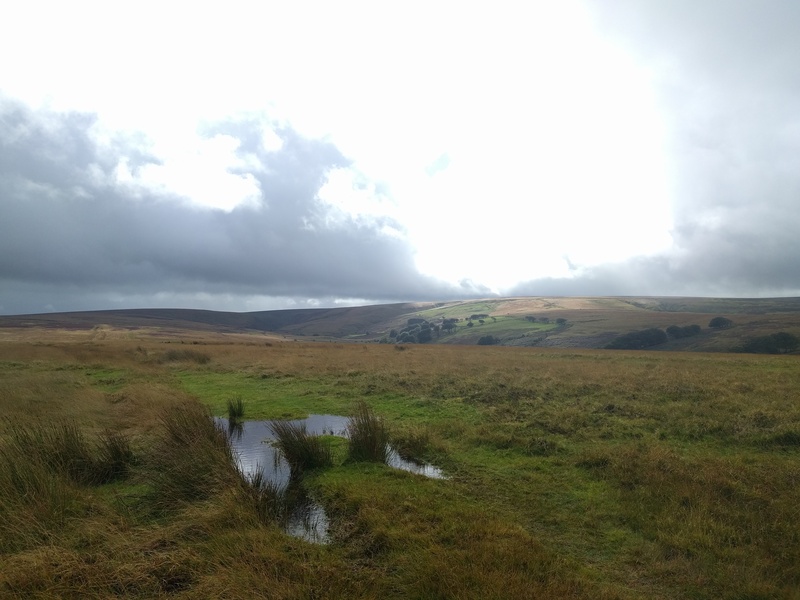 As the path dipped down alongside Hoaroak Water, we took lunch on the side of the path. A man came by looking for some mislaid kids and we pointed him in the direction of the noise that had been following us over the ridge. 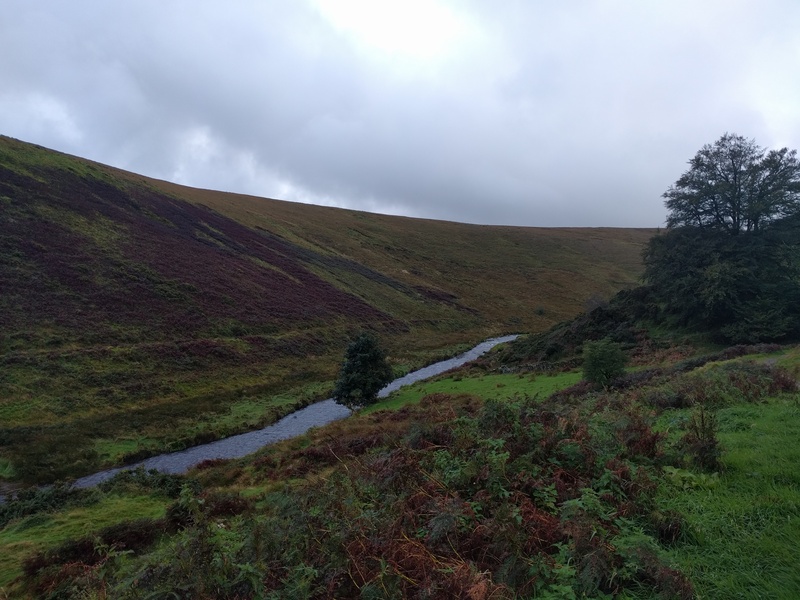 On our way again, the valley sides deepened and closed in and we found ourselves alongside a more vigorous Hoaroak Water. Just on the county border, we had to find a way across. 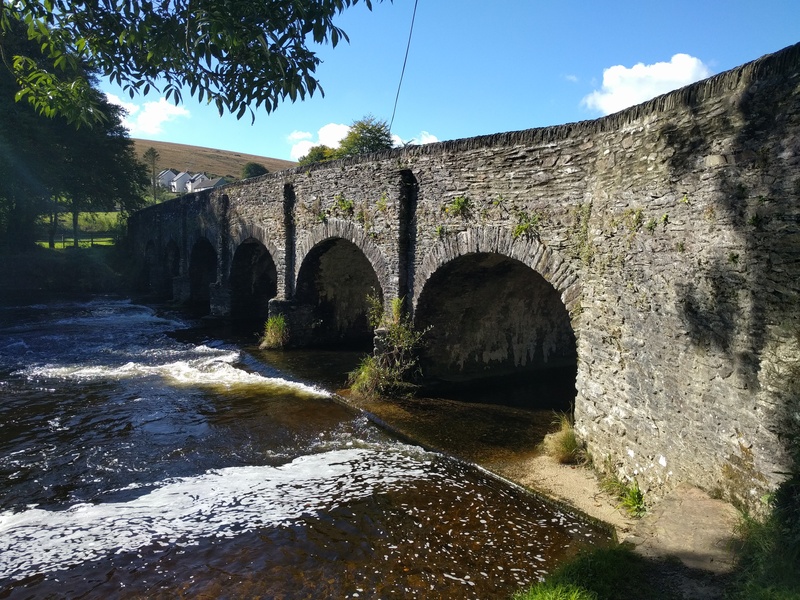 A fruitless recce meant only one thing – a wade. The man leading the youth group obviously came to the same conclusion and started a human chain across the water, handing the kids one by one through the knee deep maelstrom. Finally while we were dithering about whether to push on further upstream, he offered us a go and we took him up on it. 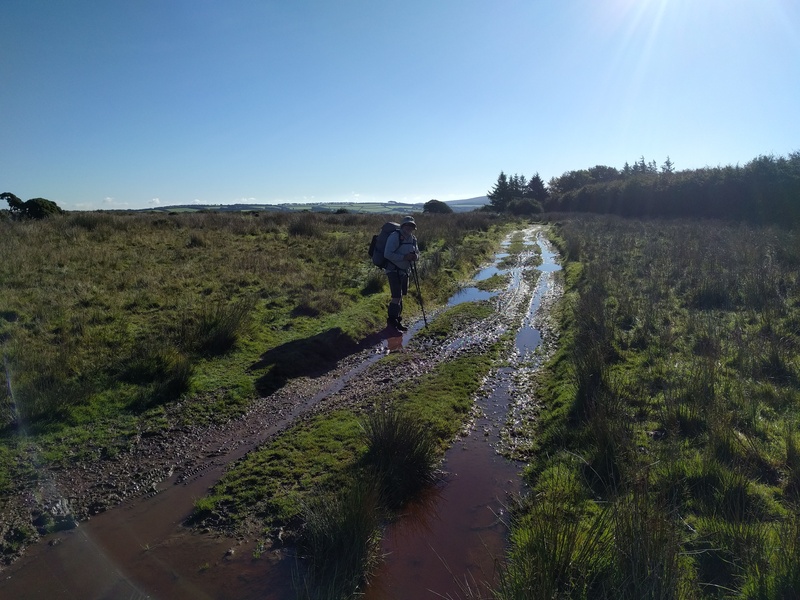 Wet-legged we pushed on into Somerset, a further stream fording further up being necessary before we reached the source of the River Exe at Exe Head. We squelched our way down to the road and across fields into Simonsbath, our only thought being the pub there. At this point, Paul was seriously contemplating seeing if they had a room for the night. Dismayed to find it shut on a Saturday afternoon we regrouped under the shelter of a small porch as the weather also decided to join the fray. Dinner plans were shot and Paul seemed really disappointed that there would be no room. 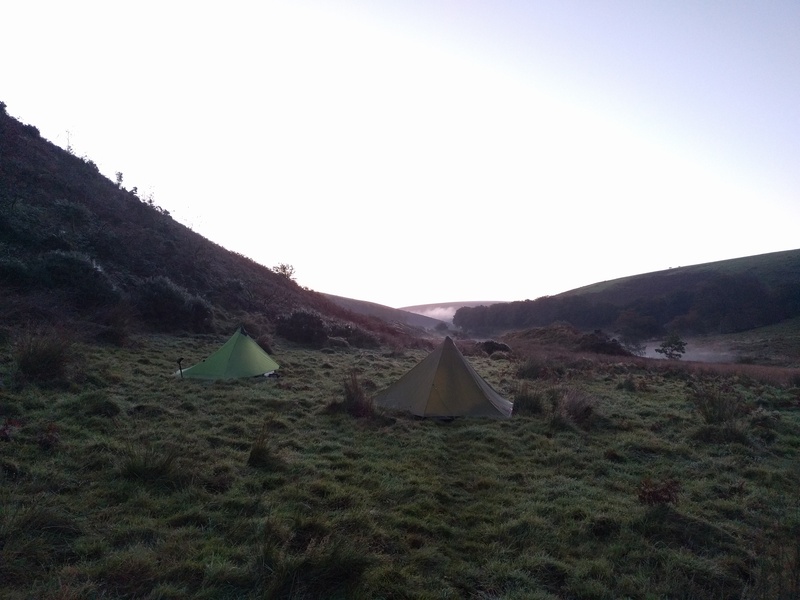 Neither of us was keen to wait the hour and a half until the pub reopened, especially as if they didn’t have a room we’d be stuffed for making it to the backup of our original planned wild camp pitch. So we carried on. The route now took us alongside the River Barle and a twisting, deep and narrow valley. Wild camp radar was activated as we squelched along the wet path, and we eventually found an ok spot close to our original plan. 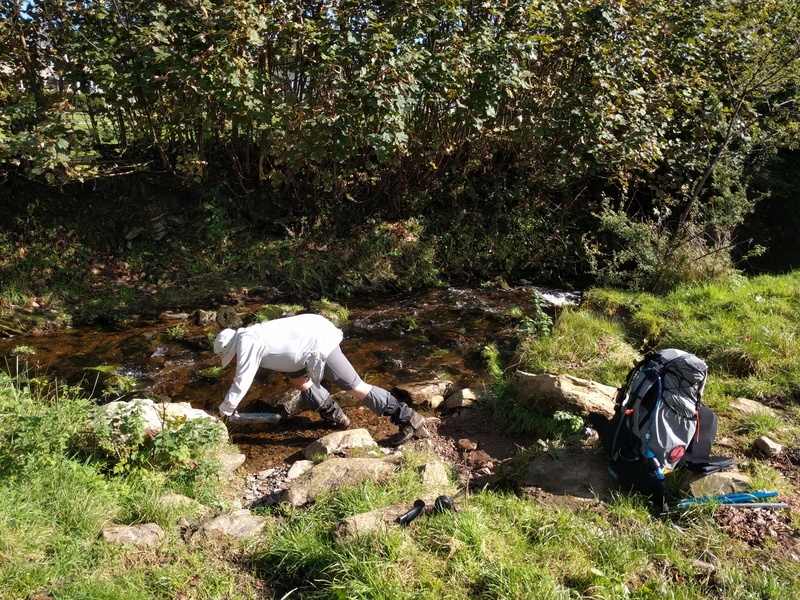 The wade through wet vegetation to an overgrown riverbank to collect water was a bit of an ordeal though and legs that had largely dried were now soaking again. The rain came in soon after and we spent the evening confined to our shelters. With the new day came renewed hope. 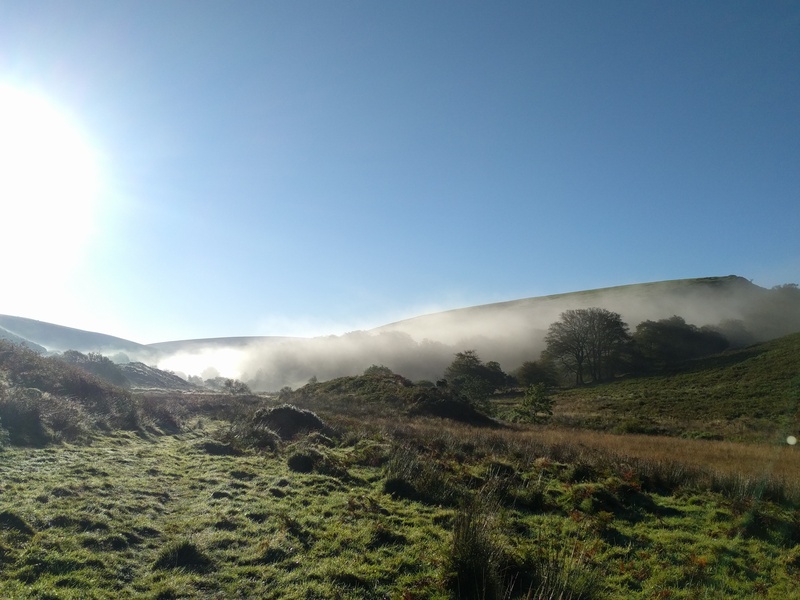 The rain had gone and blue skies appeared as we continued down the Barle. Saturday had been the only day with a bad forecast and that was now behind us. Surely things would get better now. Still wet feet in still wet boots trudged downriver to the dream of something open in Withypool. Naturally the pub wasn’t open, but to be fair it was mid-morning on a Sunday, and we instead found a tea room that also had wifi. Tea and a pasty were tucked away. I followed up with cake too. Re-fortified we set off again. 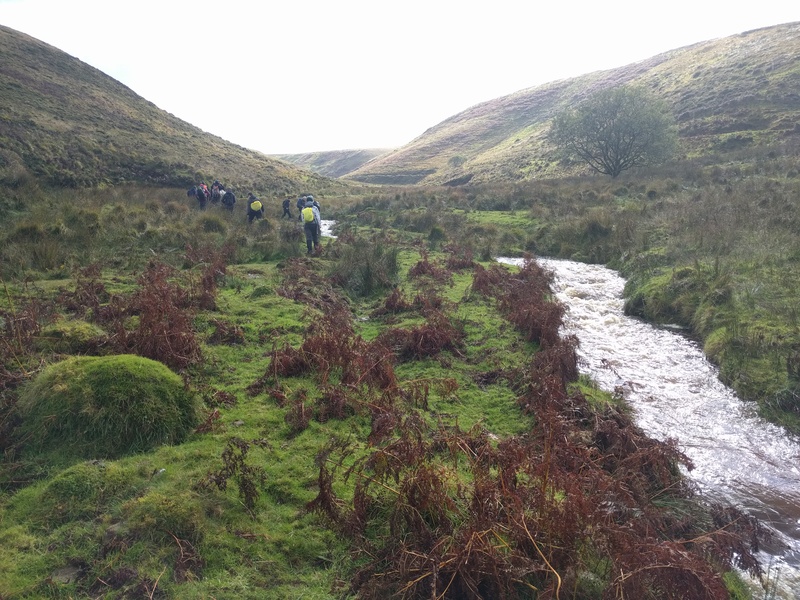 After the conditions we’d found alongside the Barle and in light of the rain we’d had, we now chose to take the alternative route over the hill rather than along the Barle, for which there were warnings that it could become submerged. A quick trot over some farmland would do nicely. Sadly it was a mud fest climbing up onto Parsonage Down and we were glad to rejoin the main path. Just after Hawkridge we left Somerset and regained the sanctuary of God’s Own County. Somerset hadn’t been particularly friendly to us – closed pubs, soakings and mud galore – and neither of us were sad to see the back of it. 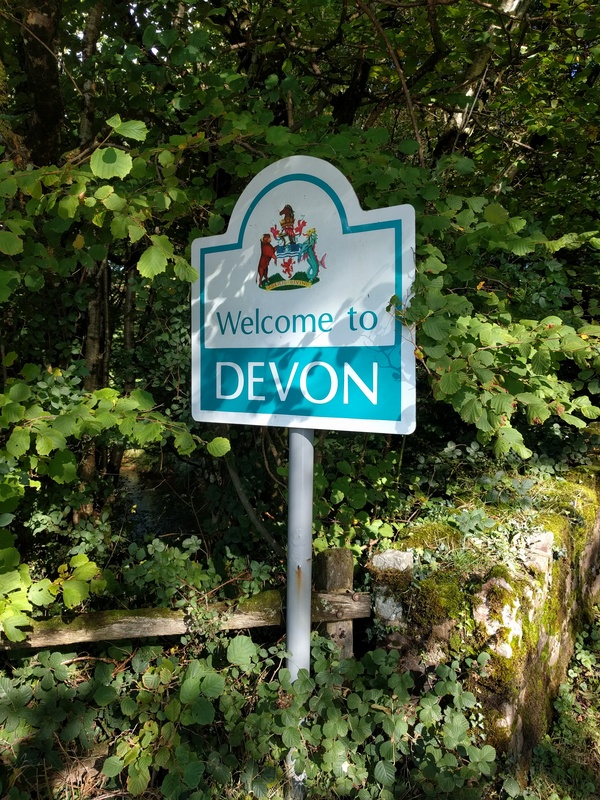 It was all Devon from here on, and that could only be a Very Good Thing. 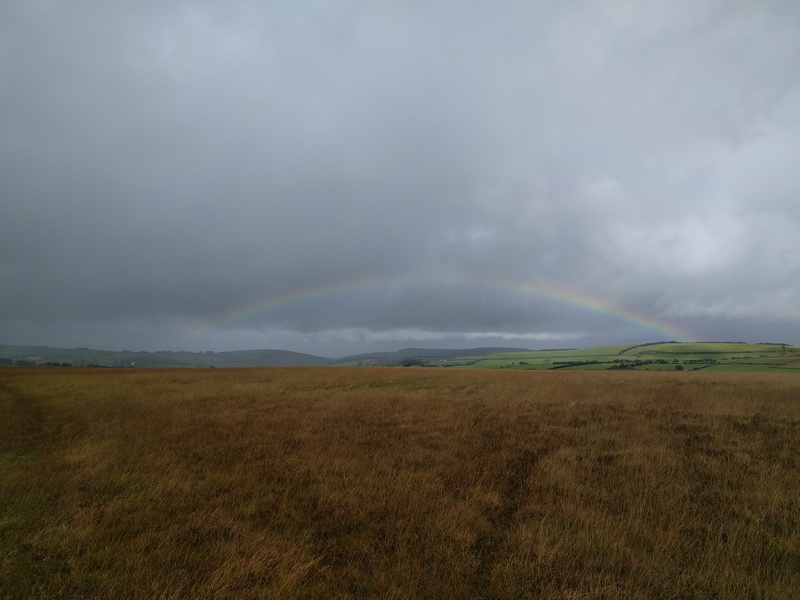 We climbed up onto West Anstey Common and behold the sight that greeted us as we crested the ridge: Dartmoor. Distant but clearly visible and with individual tors recognisable. Spirits soared. 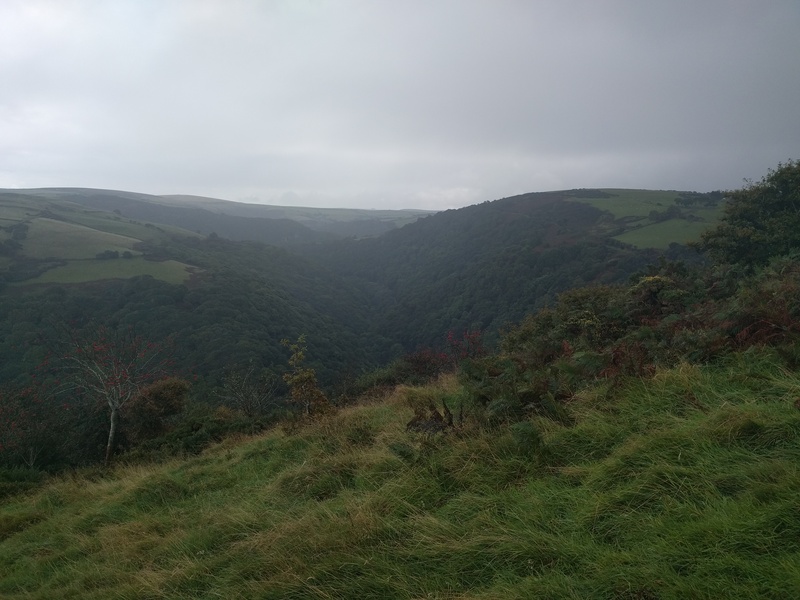 We spent a few minutes sitting looking at the view, before descending to the lanes and leaving Exmoor behind us. 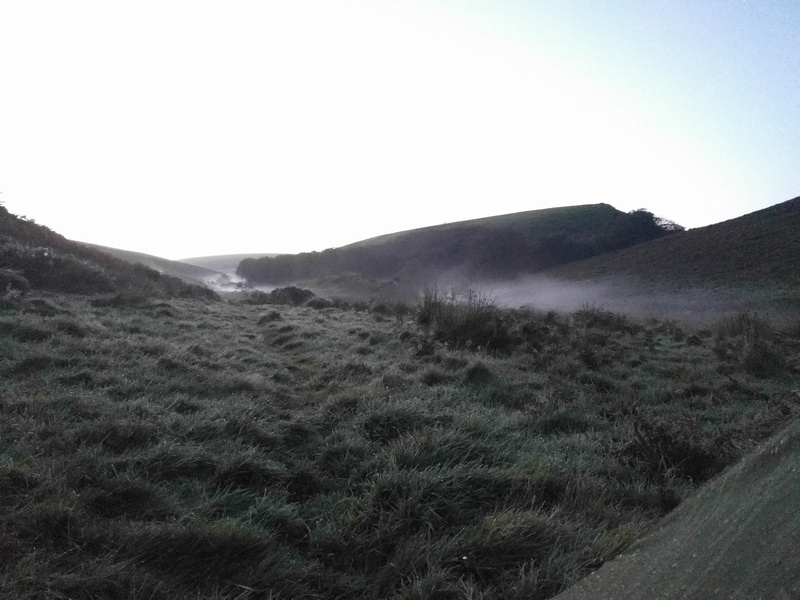 Knowstone was our target and a camp at a farm there. Secretly though, I suspected Paul was hankering after a room at the pub. Whatever, this became academic as we neared the village. 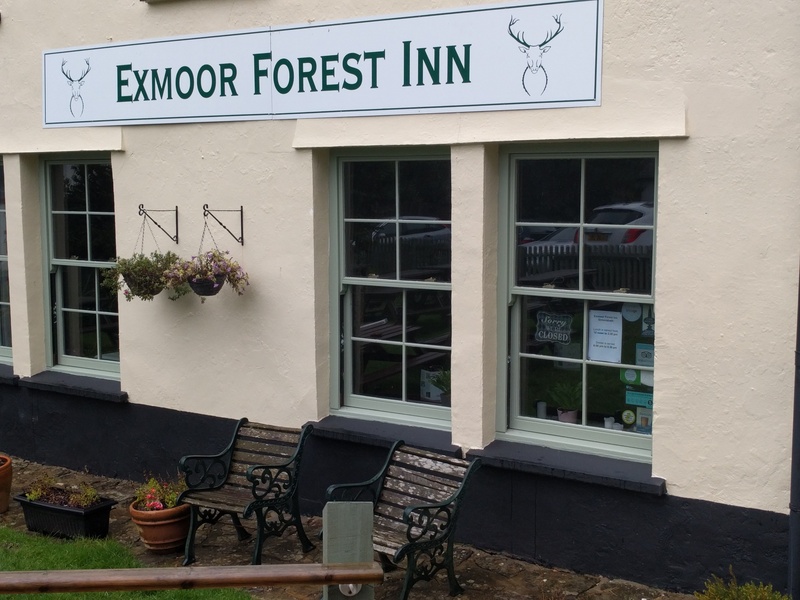 A chat with some “alternative” types living in a clearing in the wood revealed the pub would be shut. They tried to entice us to join them, luring us with beer. But we needed to do the miles and ploughed on. We arrived in Knowstone and lo and behold the pub was shut. 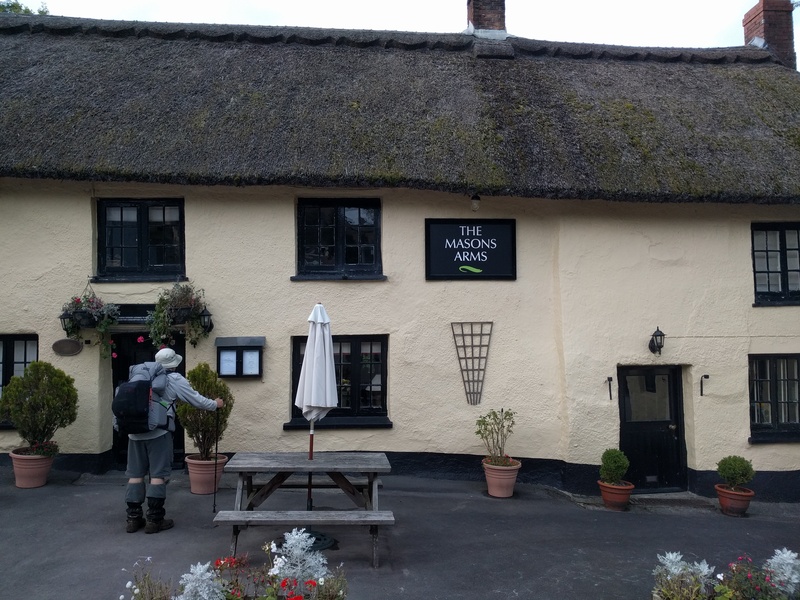 Not that I’d have been keen anyway – hikers generally don’t want to pay £24 for a duck risotto. We made use of their benches though as we worked out what to do next. An exploratory walk through the village revealed no trace of the fabled B&B that legend has it is there. It would be dark in half an hour or so and all thoughts of trying the farm had vanished. A phone call for a cab to Morchard Bishop was happily aborted as a local passed by and gave us the name and location of the B&B. A quick call and we were in, albeit having to kill some time while the landlady made up the beds. We settled into our B&B, a hot shower, clean clothes and a night in front of the TV with the landlady. It certainly felt like we’d deserved it. You’re not selling this to me! Awesome post. Looking forward to reading your further adventures.